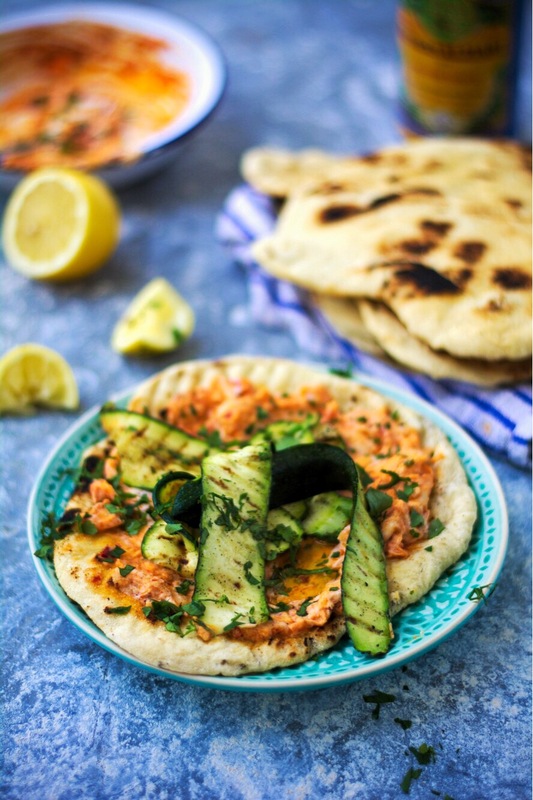 Flatbreads with harissa and butter bean purée and chargrilled courgette. The dough has risen again after the first thirty minutes. I knocked it back with a gentle flick or two of the wrist and folded it in on itself a few times before shaping into a smooth ball. The soft, smooth, elastic dough felt good and I just knew it would be delicious when cooked on a firey hot griddle pan. The olive oil and yoghurt and the spoonful of sourdough starter added to the mixture has given it a silken tang and it gently springs back on itself when prodded. I leave it for another hour in the bowl by the warm oven, covered with clingfilm and check on it every now and then, watching it double and transform slowly before me. This is the joy of bread making. I get the most from it when I do it by touch and feel, judging the amount of flour or water needed by sight and how the wet dough clings to my fingers or crumbles in my hand, needing more liquid. In my mind, it’s a living thing that needs looking after and caring for until it’s ready for the oven or pan. And when, miraculously, you’ve managed to keep a starter going for nearly two years, each loaf or dough feels that much more special. I have written a pitta bread recipe here before, and while that was more than good enough, this one has a few tweaks that I feel improve it. But I can guarantee that the next time it will again be different. Once you get the hang of feeling how the dough works, you can do what you want with it. You’ll know when it’s going to work or not. I cooked these on the griddle pan then finished them on the open gas flame, the bread bubbling and inflating here and there, smoking slightly, occasionally catching fire. Charred and hot, I covered one flatbread with a base made from crushed butter beans mixed with a tablespoon of harissa, some natural yoghurt, salt and pepper and some chopped parsley. On the still hot griddle pan. I charred some courgette slices with a little olive oil and ground cumin, well seasoned. A few chilli flakes wouldn’t have gone amiss here, but I was too hungry by this point. Sliced there and then on the worktop, I ate it plateless and very inelegantly, in such a way that I would have told the children off for. However, they were still at school and they can eat theirs later, at the table. Add some olive oil, probably about 75ml, enough water to make a soft dough (this will be around 350ml), a tablespoon or two of natural yoghurt, and if you have it, some sourdough starter. Shape into a ball and leave covered in the bowl for half an hour. Punch it gently to deflate it and fold it around itself again a few times before reshaping into a ball, covering again and leaving for about an hour. Throw some semolina on the worktop, break off small balls of dough and roll them into thin circles about the size of a single. That’s 7″. Keep warm in a towel and finish the rest of the dough. Serve immediately with the butter bean mixture or some houmous or suchlike. I came here to tell you that pita bread recipe is on point.